North America’s November snow cover set a record for the month in the satellite era. A number of winter storms dumped snow in the northern half of the U.S. and southern Canada. One of the coldest Novembers on record helped keep snow on the ground longer. 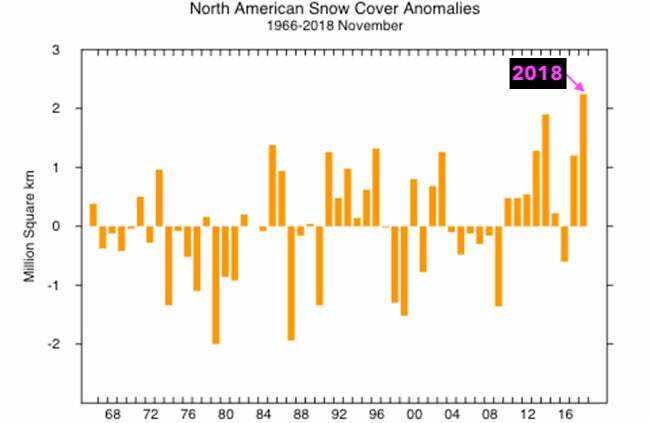 November 2018’s North America snow cover set a record for any autumn month in the satellite era. Last November’s average snow cover across North America was an estimated 5.24 million square miles, topping the previous November record of 5.11 million square miles in 2014, according to data from the Rutgers University Global Snow Lab (GSL) dating to 1966. Plot of North America November snow cover anomalies from 1966 through 2018. November 2018’s record snow cover extent was roughly 1.4 million square miles above the average from 1981 through 2010. This extent of snow cover was about 861,000 square miles larger than average, over three times the size of Texas. November 2018 snow cover analysis, shown as a percent of days with snow cover. This was largely due to the anomalous snow cover over northern and parts of the central U.S., as well as southern Canada. Persistent cold from the Northeast to the Plains to the northern and western Gulf Coast and a number of expansive winter storms gave this winter weather season a fast start, driven by a persistent southward nosedive of the jet stream. 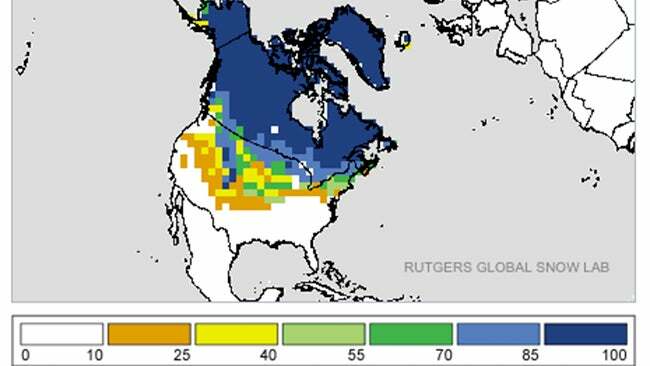 “This permitted arctic air to plunge into a good portion of Canada, and subsequently the U.S., leading to early-season snowfall and also remaining cold enough for the snow cover to become established for the season in northerly locales,” said Rutgers University professor and New Jersey state climatologist David Robinson in an email to weather.com. By the end of the month, every U.S. state except Florida had picked up at least a trace of snow in autumn.